Is Europe America's Friend Or Foe? Since Donald Trump became US president in January 2017, his conduct has been astonishingly erratic, but his policies have been more consistent than foreseen by most observers. Trump’s volatility has been disconcerting, but on the whole he has acted in accordance with promises made on the campaign trail and with views held long before anyone considered his election possible. Accordingly, a new cottage industry in rational theories of Trump’s seemingly irrational behavior has developed. The latest challenge is to make sense of his stance towards Europe. At a rally on June 28, he said: “We love the countries of the European Union. But the European Union, of course, was set up to take advantage of the United States. And you know what, we can’t let that happen.” During his recent trip to the continent, he called the EU “a foe” and said it was “possibly as bad as China.” Regarding Brexit, he declared that British Prime Minister Theresa May should have “sued” the EU. 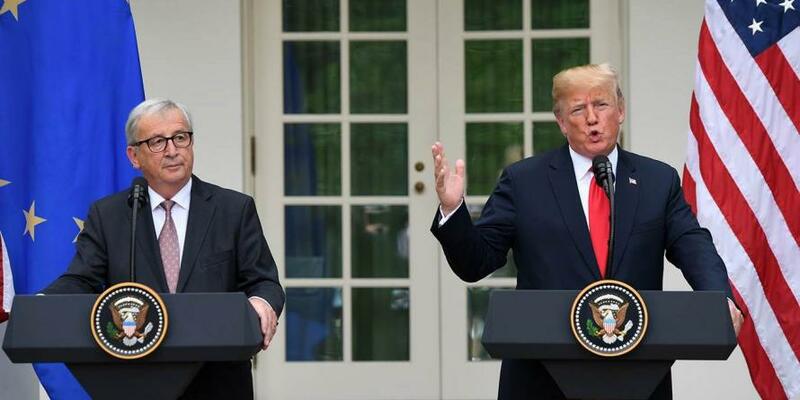 Then came the truce, on July 25: Trump and Jean-Claude Juncker, the president of the European Commission, agreed to work jointly on an agenda of free trade and World Trade Organization reform. So it seems we are friends again – or perhaps just resting before the dispute resumes. But the deeper question remains: Why has Trump repeatedly attacked America’s oldest and most reliable ally? Why does he seem to despise the EU so deeply? Why should the US try to undermine Europe, rather than seeking closer cooperation to protect its economic and geopolitical interests? Trump’s approach is particularly striking given that China’s rapid emergence as a strategic rival is America’s main national security issue. Contrary to earlier hopes, China is converging with the West neither politically nor economically, because the role of the state and the ruling party in coordinating activities remains far greater. Geopolitically, China has been actively building clienteles, most visibly through its Belt and Road Initiative, and it intends to “foster a new type of international relations” that departs from the model promoted by the US in the twentieth century. Militarily, it has embarked on a significant build-up. Obviously, China, not Europe, is the number one challenge to US world supremacy. Former President Barack Obama’s China strategy combined dialogue and pressure. He started building two mega-economic alliances that excluded China and Russia: the Trans-Pacific Partnership with 11 other Pacific Rim countries, and the Transatlantic Trade and Investment Partnership with the European Union. But Trump withdrew the US from the TPP and killed the TTIP before it was born. Then he opened a trade rift with the EU. And he has attacked both the EU and its member states, especially Germany. One is Trump’s peculiar obsession with bilateral trade balances. According to this view, Trump regards Germany, the rest of Europe, and China as equally threatening competitors. Nobody else thinks this makes economic sense. And the only result he can expect from this strategy is to hurt and weaken the long-standing Atlantic partnership. But he has been complaining about Mercedes cars in the streets of New York City at least since the 1990s. A second explanation is that Trump wants to prevent the EU from positioning itself as the third player in a trilateral game. If the US intends to turn the relationship with China into a bilateral power struggle, there are good reasons for it to regard the EU as an obstacle. Because it is itself governed by law, the EU is bound to oppose a purely transactional approach to international relations. And a united Europe that commands access to the world’s largest market is not a trivial player. But after the EU has been undermined, if not disbanded, weak and divided European countries would have no choice but to rally behind the US. Finally, a more political reading of Trump’s behavior is that he is seeking regime change in Europe. In fact, he has not disguised his belief that Europe is “losing its culture” because it has let immigration “change its fabric.” And Stephen Bannon, his former chief strategist, has announced that he will spend half of his time in Europe to help build an alliance of nationalist parties and win a majority in next May’s European Parliament elections. A few weeks ago, only the first reading looked plausible. The other two could be dismissed as fantasies inspired by conspiracy theories. No US president had ever presented the EU as a plot to weaken the US. Indeed, all of Trump’s postwar predecessors would have recoiled in horror at the idea of the EU’s dissolution. But the US president has gone too far for Europe to dismiss the more dismal scenarios. For the EU, this is a pivotal moment. In the 1950s, it was launched beneath the US security umbrella and with America’s blessing. Since then, it has been built as a geopolitical experiment conducted under US protection and in the context of a US-led international system. For this reason, its external dimensions – economically, diplomatically, or regarding security – have always come second to its internal development. What the recent crisis signifies is that this is no longer true. Europe must now define its strategic stance vis-à-vis a more distant and possibly hostile US, and vis-à-vis rising powers that have no reason to be kind to it. It must stand for its values. And it must urgently decide what it intends to do regarding its security and defense, its neighborhood policy, and its border protection. This is an acid test. Economically, the EU still has the potential to be a global player. The size of its market, the strength of its major companies, a unified trade policy, a common regulatory policy, a single competition authority, and a currency that is second only to the dollar are major assets. It could – and should – use them to push for a revamping of international relations that addresses legitimate US grievances vis-à-vis China and legitimate Chinese concerns over its international role. Europe has played a leading role in fighting climate change; it could do the same for trade, investment, or finance. Europe’s main problem is political, not economic. The challenge it is facing comes at a moment when it is divided between island and continent, North and South, and East and West. And the questions posed are fundamental: What defines a nation? Who is in charge of borders? Who guarantees security? Is the EU based on shared values or on the pure calculus of national interests? If the EU fails to define itself for a world that is fundamentally different from that of ten years ago, it probably will not survive as a meaningful institution. If it does, however, it may regain the sense of purpose and legitimacy in the eyes of citizens that years of economic and political setbacks have eroded.